I learnt baking the hard way. My sponge cakes would never be right because the butter wasn't whisked enough or there was more work to be done on the egg-whites or........ Well, the list is really long! To cut a long story short, I had my first success with a vegetable cake using vegetable oil, Pistachio and Zucchini Cake, which didn't have any work at all to be done. No matter how many mistakes I did with the preparation of the batter, the cake would come out right and perfect, every time. It was another long journey before I made the perfect Sponge or Sand or Madeira. And after going through all that trouble I was quite surprised to come across this "French" Almond Sponge Cake from Happy Home Baking (sourced from Easy Cakes by Linda Collister), which even a child can bake with their eyes closed - and you always end up with the perfect cake! Though there are times when I wonder if it is the French that made the cake easy or was it Linda, the baking and chocolate expert who made this easy. 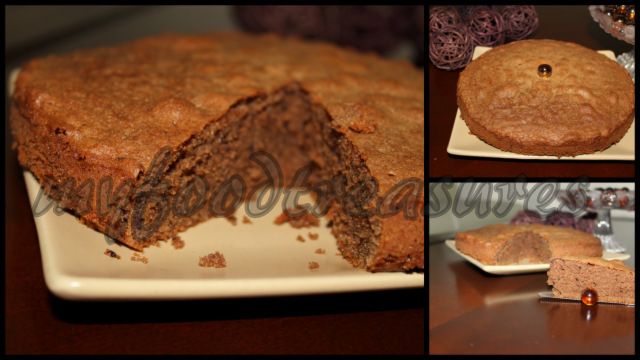 Today I have prepared a Mocha Almond Sponge Cake which is light, moist and delicious. The same recipe forms my base for a Sponge roll, a Joconde or a creamy dessert like a Cheesecake or a Mousse. Now if you really do not want to go through all that trouble of making a complete dessert this Mocha Cake is enough to amuse you for a morning tea. The strong flavours of chocolate and coffee works as a complete treat and you can't go past the nutty flavour of almond which makes it an impeccable "dessert" just by itself. Please follow the link for Lemon Friands on my blog which is another cake prepared with almond meal and is just as easy to prepare. 1. Pre-heat fan-forced oven to 160° C. Prepare an 8-inch spring form pan with butter and baking paper. 2. In a bowl sift together almond meal, plain flour, baking powder, salt and cocoa powder. Dissolve coffee powder in warm milk and set aside. 3. In a bowl beat together butter, sugar and eggs, with an electric mixer, until smooth. Add sifted dry ingredients and coffee-milk mixture to the butter mixture and beat again until batter is light and fluffy. Spoon the batter into prepared pan, spread evenly and bake for 25 - 30 minutes or until a skewer inserted into the centre comes out clean. Stand on wire rack to cool for at least 10 minutes before turning out. 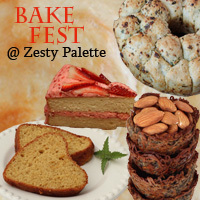 Sending this to Bake Fest#13 founded by Vardhini of CooksJoy and co-hosted by Anu of Anu's Healthy Kitchen. Wow, this looks absolutely divine. Love the simple recipe for it! That dessert looks so tempting. The recipe itself is pretty easy too. Thank you so much for sharing.